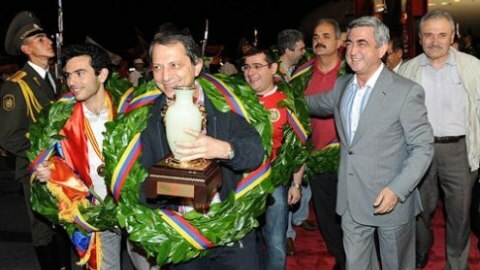 Following the conclusion of the 2012 Armenian Chess Championships, the national federation has announced the lineups for the World Chess Olympiad, which will be held in August in Istanbul, Turkey. Men’s Team: Levon Aronian, Sergei Movsesian, Vladimir Akopian, Gabriel Sargissian, Tigran L. Petrosian. Coach – Arshak Petrosian. Women’s Team: Elina Danielian, Lilit Mkrtchian, Lilit Galojan, Maria Kursova, Anna Hairapetian. Coach – Artur Chibukchian.